Part of my research includes studying the unwritten constitution. When Americans refer to their constitution, they mean one complete and concise document; while Americans can frame a copy of their constitution and hand it on a wall, Canadians cannot, because our constitution consists of several written sources and unwritten convention. To many, perhaps because of an unconscious reference point to the American system, which is not truly comparable to Westminster parliamentarism in some crucial ways, the very concept of an “unwritten constitution” may sound inherently paradoxical, so I will attempt to explain here why it is not. An unwritten constitution consists of conventions. In my earlier post on the accidental development of cabinet government, I argued that constitutional convention evolves from a custom or practice that served a valuable purpose by complementing written rules and statutes, and ultimately became integral to the conduct of parliamentary government. They are also politically enforceable, and therefore not justiciable; parliamentarians, not the courts, must sort out their implications. As a result, conventions tend to develop and change over time and practice as needed. Problems can admittedly arise when substantial disagreement exists over their interpretation, which we witnessed here in Canada in December 2008. (More on that later!) In Canada, these conventions have become as essential to the function of government as the written Constitution Act, 1867 and the Constitution Act, 1982. Moreover, the Constitution Act, 1867 acknowledges that unwritten convention forms an integral part of the Canadian constitution by describing the latter in the preamble as “similar in Principle to that of the United Kingdom.” For example, the cornerstone of parliamentary government, responsible government, is but one of these unwritten constitutional conventions, and without it, modern Westminster parliamentarism would cease to function and representative government. A constitution based on unwritten conventions is in many respects more substantive and powerful than a written constitution, because the former can only exist when it holds a moral authority over the system that compels people to respect and observe it. In other words, an unwritten constitution like that of the United Kingdom can only flourish when a genuine, well-established democratic spirit already exists. This is the sublime and subtle virtue of an unwritten constitution. In contrast, written constitutions, under the wrong conditions, can become nothing more than worthless scraps of paper: Article 50 of the Soviet Union’s written constitution enshrined the freedom of speech, for instance – and we all know of that document’s effectiveness in securing liberty. That is why I would have expected a respectable historian and a former Member of Parliament like John English to respond to the false premise of the reporter’s question. Pierre Trudeau did not “give Canada its own constitution”, as the interviewer claims and as English tacitly accepts. Sadly, however, English merely shares a false opinion popular among many laymen and, more disturbingly, political scientists alike. I’ve engaged some professors who study or teach “Canadian politics” and yet know little to nothing about our constitution ­– the practical foundation that makes all of their studies possible – but prefer instead of focus exclusively on perfunctory and trite issues like political parties and identity politics. One professor in particular from Carleton University didn’t even seem to understand the distinction between the Charter of Rights and Freedoms and the Constitution Act, 1982 – let alone the nuances of the amending formula contained in the latter – and another professor, also from Carleton, demonstrated before an entire audience his lack of appreciation for the fact that history matters in Westminster parliamentarism. The fourth point of organic Canadian statutes refers to legislation passed by the Parliament of Canada of constitutional significance integral to our system of government. I’m not sure if a precise definition of this list exists, but it would probably include the following: The Elections Act, the Supreme Court Act, the Financial Administration Act, the Official Languages Act, etc. Pierre Trudeau did many things, but he did not give Canada its own constitution – his government merely build upon a constitution that, contrary to popular belief, had already been well-established. The Trudeau government did “give us the Charter” – but Trudeau did not suddenly confer rights upon previously subjugated Canadians. The Charter merely codified most of the rights that Canadians had already long enjoyed. This entry was posted in Constitution (Written). Bookmark the permalink. 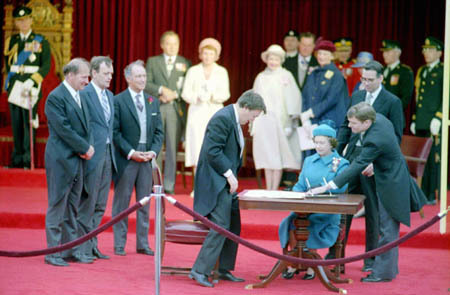 6 Responses to Defining Canada’s Constitution: Canada Did Have One Before Trudeau and 1982! I agree, Trudeau did not create the constitution, despite the fact that many think so – thank goodness for political scientists. However, I would not be too quick to say that one system (unwritten or partly-written) is better, or more powerful, than the other. They are designed for a level of flexibility or interpretation that was desired upon their creation and that is subjected to those who chose to implement the constitution. Why I feel is not justifiable as good or bad, weak or strong. Also, why moral authority? I don’t see how morality can solely effect one type of constitution. I would argue that a country’s, state’s (or what have you) constitution is based on its political evolution. i.e. Canada incorporating a system that is based on Britain’s, while the United States has rejected much of Britain’s political influence and procedures. I like the comment of framing the constitution, although not able to have a single constitution framed, Canadians can have an eclectic collection of constitutional documents on their wall, which could make for a nice collection. It’s not that moral authority applies only to unwritten constitution. The vast majority of Americans would ascribe such a quality to their written constitution as well. I was attempting to illustrate by way of the Soviet example that all effective constitutions (unwritten or written) wield moral authority — and that an effective unwritten constitution must necessarily wields moral authority. This is not to say that a written cannot hold moral sway, merely that it does not necessarily do so (as the Soviet example shows).